The major part of the Earth's volcanic activity takes place at plate margins. However, a significant fraction occurs within the interiors of plates. In oceans the intra-plate volcanic activity gives rise to linear island and seamount chains such as the Hawaiian-Emperor and Line Islands chains in the Pacific (Fig. 5.7). Moreover, several of these Pacific island chains appear to be mutually parallel. Where the volcanic centers in the chains are closely spaced, aseismic ridges are constructed, such as the Ninety-East Ridge in the Indian Ocean, the Greenland-Scotland Ridge in the North Atlantic, and the Rio Grande and Walvis ridges in the South Atlantic. These island chains and ridges are associated with broad crustal swells which currently occupy about 10% of the surface of the Earth, making them a major cause of uplift of the Earth's surface (Crough, 1979). 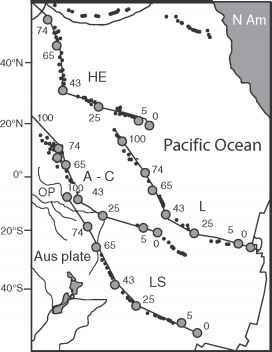 Figure 5.7 Hotspot tracks on the Pacific plate. HE, Hawaiian-Emperor chain; A-C, Austral-Cook islands; L, Line islands; LS, Louisville chain; OP, Ontong-Java Plateau. Numbers on chains indicate the predicted age of seamounts in Ma (redrawn from Gaina et al., 2000, by permission of the American Geophysical Union. Copyright © 2000 American Geophysical Union). alous feature that will eventually become welded to a continental margin as a suspect terrane (Section 10.6.1). An example of an oceanic island chain is the Hawaiian-Emperor chain in the north-central Pacific Ocean (Fig. 5.7). This chain is some 6000 km long and shows a trend from active volcanoes at Hawaii in the southeast to extinct, subsided guyots (flat-topped sea-mounts) in the northwest. Dating of the various parts of the chain confirmed this trend, and revealed that the change in direction of the chain occurred at 43 Ma (Clague & Dalrymple, 1989). The Hawaiian-Emperor chain parallels other chains on the Pacific Plate, along which volcanism has progressed at a similar rate (Fig. 5.7). As indicated above, a possible explanation of the origin of island chains was proposed by Wilson (1963). It was suggested that the islands formed as the lithosphere passed over a hotspot. These hotspots are now thought to originate from mantle plumes rising from the lower mantle that thin the overlying lithosphere (Section 12.10). The volcanic rocks are then derived from pressure-release melting and differentiation within the plume. Such plumes represent material of low seismic velocity and can be detected by seismic tomography (Section 2.1.8; Montelli et al., 2004a). Although the mantle plume mechanism has been widely adopted, some workers (e.g. 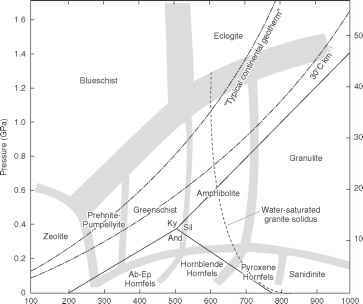 Turcotte & Oxburgh, 1978; Pilger, 1982) have questioned the necessity for mantle hotspots and suggest that magmas simply flow to the surface from the asthenosphere through fractures in the lithosphere resulting from intra-plate tensional stresses. This mechanism obviates the problem of maintaining a mantle heat source for long periods. It does not, however, explain why fractures in the same plate should trend in the same direction and develop at similar rates (Condie, 1982a). Morgan (1971, 1972a) proposed that mantle plumes remain stationary with respect to each other and the lower mantle, and are of long duration. If so, the hotspots represent a fixed frame of reference by which absolute motions of plates can be determined (Section 5.4). 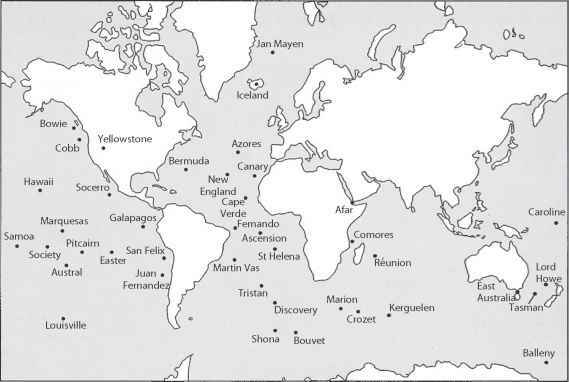 Figure 5.8 World-wide distribution of hotspots (modified from Duncan & Richards, 1991, by permission of the American Geophysical Union. Copyright © 1991 American Geophysical Union). an oceanic plateau under the sea. These remarkable episodes of localized enhanced partial melting in the mantle punctuate the geologic record and are collectively termed Large Igneous Provinces (LIPs) (Section 7.4.1). It seems probable therefore that there are at least two types of hotspot and that those originating as LIPs are the most likely to be a result of plume heads rising from deep within the mantle, probably from the thermal boundary layer at the core-mantle boundary (Section 12.10). Figure 5.9 Hotspot tracks in the Atlantic and Indian Oceans. Large filled circles are present day hotspots. Small filled circles define the modeled paths of hotspots at 5 Ma intervals. Triangles on hotspot tracks indicate radiometric ages. WM, White Mountains; PB, Parana flood basalts; EB, Etendeka flood basalts; DT, Deccan Traps (modified and redrawn from Müller et al., 1993, courtesy of the Geological Society of America). within the "oceanic hemisphere," i.e. the Pacific ocean, and have produced distinctive traces across the Pacific plate (Fig. 5.7). The Louisville Ridge originates at the OntongJava Plateau of the western Pacific. This formed approximately 120 Ma ago and is the largest LIP in terms of the volume of mafic igneous material emplaced. The Hawaiian-Emperor seamount chain may well have had a similar origin but the earlier part of this track has been subducted, the oldest seamounts in the chain dating at approximately 80 Ma. The Easter Island-Line Islands track originated about 100 Ma ago, not as an LIP, but in an area with an unusually high density of submarine volcanoes known as the mid-Pacific mountains. 50 mm a-1. Intriguingly, this corresponds with a period of major reorganization of global plate motions (Rona and Richardson, 1978), the age of the major bend in the Hawaiian-Emperor seamount chain, and a period in which the rate of true polar wander (Section 5.6) was much greater than during the period 10-50 Ma ago, when it was virtually at a standstill (Besse & Courtillot, 2002). If hotspots remain fixed, and provide a framework for absolute plate motions, then paleomagnetic studies should be able to provide a test of their unchanging latitude. Paleomagnetic data for the oceanic plates of the Pacific are sparse, and subject to greater uncertainties than those obtained for continental areas. Nevertheless preliminary results (Tarduno & Cottrell, 1997) suggest that the Hawaiian hotspot may have migrated south through as much as 15-20° of latitude during the period 80-43 Ma. Paleomagnetic results obtained from Ocean Drilling Program drill core, from which any latitudinal change in of the Reunion hotspot could be deduced (Vandamme & Courtillot, 1990), suggest that this hotspot may have moved northwards through approximately 5° of latitude between 65 and 43 Ma. These latitudinal shifts are compatible with the discrepancy between the two hotspot reference frames prior to 43 Ma ago, and support the assumptions regarding Cenozoic - late Mesozoic plate boundaries within and around the Antarctic plate. These results also imply that the major bend in the Hawaiian-Emperor seamount chain at approximately 43 Ma does not reflect a major change in the absolute motion of the Pacific plate, as originally thought, but can be accounted for almost entirely by the southward motion of the Hawaiian hotspot (Norton, 1995). Predicted hotspot traces in the Atlantic and Indian Ocean (Müller et al., 1993) are shown in Fig. 5.9, superimposed on volcanic structures on the sea floor and on land. The correlation between the two is excellent. 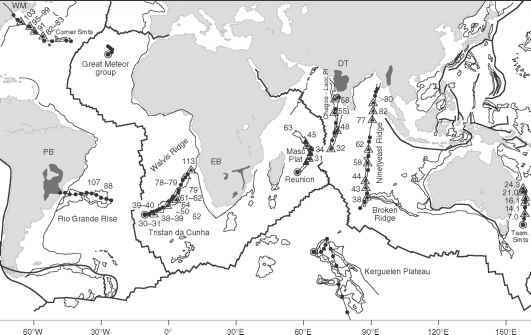 For example, the Reunion hotspot began beneath western India and was responsible for the Deccan Traps flood basalts: India's northwards motion was then recorded by the Maldive-Chagos Plateau and the Mascarene Plateau. The gap between these two features results from the passage of the mid-ocean ridge over the hot spot approximately 33 Ma ago. The hotspot is currently beneath a seamount 150 km west of the volcanically active island of Réunion. 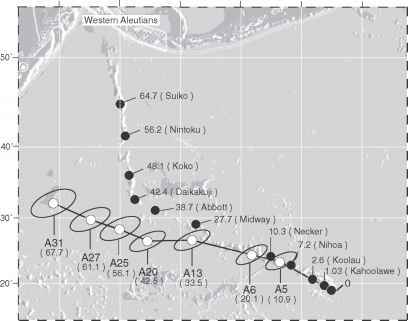 Figure 5.10 Predicted Hawaiian hotspot track (solid line) from plate reconstructions assuming that the Indo-Atlantic hotspots are fixed. Ages in Ma (redrawn from Steinberger & O'Connell, 2000, by permission of the American Geophysical Union. Copyright © 2000 American Geophysical Union). implies that its position is not fixed relative to the other major hotspots in the Indo-Atlantic domain. However one can use the absolute motions derived from the other hotspots (Müller et al., 1993) to predict the track of the Iceland hotspot on the assumption that it is fixed in relation to this frame of reference. Such an analysis has been conducted by Lawver & Müller (1994) with intriguing results (Fig. 5.11). The track can be projected back to 130 Ma, at which time the hotspot would have been beneath the northern margin of Ellesmere Island in the Canadian Arctic. Lawver & Müller (1994) suggest that such a track might explain the formation of the Mendeleyev and Alpha Ridges in the Canadian Basin of the Arctic Ocean and the mid-Cretaceous volcanic rocks of Axel Heiberg Island and northern Ellesmere Island. At 60 Ma the hotspot is predicted to have been beneath West Greenland where there are volcanics of this age, for example on Disko Island. At 40 Ma it would have been beneath East Greenland which may explain the anomalous post-drift uplift of this area. On this model the North Atlantic igneous province, initiated at approximately 60 Ma, was a result of rifting of lithosphere that had already been thinned by its proximity to a hotspot, rather than the arrival of a plume head. In contrast to this interpretation, however, there is considerable doubt, on the basis of geochemical and geophysical data, that the Iceland hotspot is fed by a deep mantle plume (Section 12.10). The Iceland hotspot is therefore something of an enigma.